Apple has started rolling out the iOS 10.2 beta update to developers. The new iOS 10.2 beta update comes after the public launch of iOS 10.1.1 firmware update. Apple starts iOS 10.2 beta development a week after the iOS 10.1 public release. You can download iOS 10.2 beta on your iPhone or iPad device. iOS 10.2 beta download is available for both developers and public beta testers. You can use the iOS 10 mobile provisioning profile to get an iOS 10.2 beta running on your iOS device. Apple has packed new features and functions in iOS 10.2 beta for developers. And, soon they will be released for public users. Apple is rapidly working on iOS 10 development, and with release of iOS 10.2 beta, it seems we are going to get more than few iOS 10 major updates this year. Apple is keeping tabs on iOS 10 features, and every time they roll out few features to make sure there is always something for later. If you are an iOS Developer Center member, you can quickly get the iOS 10.2 beta update on your device. However, if you are not registered with Apple’s iOS Developer Center then you might have to download iOS 10.2 beta through Public Beta testers. The iOS 10.2 Public Beta gets few releases and some functions stripped from the actual beta version. There are several ways to still get the iOS 10.2 beta developer version, but it is not recommended as they are for developers only. Apple is releasing different beta builds so public users can still enjoy unreleased features before everyone, but you need to keep in mind that it is public beta or beta build. Both Public Beta and Beta Builds are not ready for daily usage devices. They are for developers and Pro users. 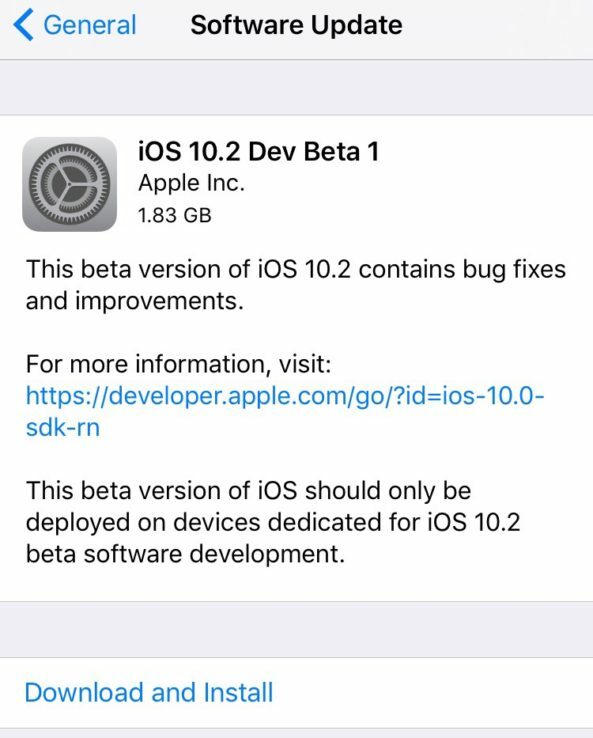 If you are still interested to install/download iOS 10.2 beta on your device, you can follow our below-mentioned guide to begin with iOS 10.2 beta download process. You can easily download iOS 10.2 beta using both OTA Software Update and iTunes Software Update option. The first one is more favored and recommended. It saves you from extra mileage of steps that you need to take before you can download iOS 10.2 beta update on your device. Step 1: Make backup of your device using iTunes with encrypted backup option. Step 2: Make sure you have the iOS 10 Mobile Provisioning Profile access, otherwise, you can get it from here. Step 3: Download/Install iOS 10.2 beta Mobile Provisioning Profile on your device. Step 4: Hard Reboot your device. Step 5: Navigate to Settings > General > Software Update. Step 6: You will get the iOS 10.2 beta download in OTA Software Update page. Step 7: Simply start downloading iOS 10.2 beta, and once done go ahead with installation. That’s it. In less than seven steps, you can get the iOS 10.2 beta update on your device. The process is similar to what you have followed during the iOS 10 beta development. You can get the iOS 10.2 beta on both developer and non-developer iOS devices. It ignores the Apple check on iOS beta build and let you install iOS 10.2 beta without developer access. Furthermore, it saves you lot of trouble with other options. There are more than five major features that Apple included in iOS 10.2 beta build. You can enjoy all of them by getting the iOS 10.2 beta update.